In the springtime we chatted with Rachel about seed sharing, sewing and future collaborative adventures. She is a 2014 recipient of the MN State Arts Board Artist Initiative Grant. This summer she is learning to use paint in her stencil transfer process, making her work permanent and allowing her to create outdoor murals in her neighborhood. We are currently hatching a plan to road trip with Rachel to Seed Savers Exchange in Decorah, IA this summer. Learning more about seed sharing and touring the heirloom gardens are on the agenda. Rachel recently wrote a thoughtful essay on creativity as something other than a commodity, as a gift or inheritance we are all born with-a creative commons. Notes on creativity as a commons. Is art a commons? Or does collective creativity violate the individualistic nature of artists themselves? That’s a topic I’ve explored both in my art and in conversations with artists around the U.S. Most of the artists I’ve talked with welcome movement toward a commons-based society as a way to increase the meaning and value that art offers to all of our lives. The current status of the art market—the buying and selling of art at exorbitant prices as part of an increasingly privatized and exclusive sphere where art is out of reach, literally and figuratively—hurts us all. The relentless expansion of the market into the world of art calls us to protect access to making and participating in art. Preventing further encroachment of the market into the realms of art and culture can help ensure that people enjoy and partake of art in the broadest sense as well as protecting artists’ ability to draw more freely from material, ideas and ways of working in order to create anew. 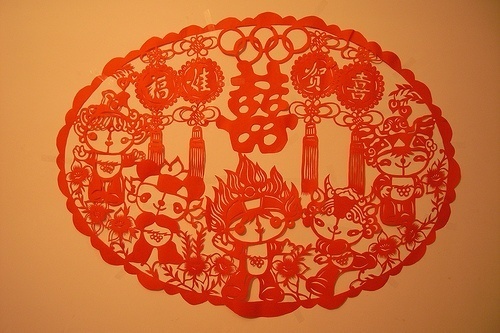 My first encounter with art as a commons took place from 1998 to 2001, when I had the great fortune to live in China and study the traditional folk art of paper cutting. I traveled to many remote villages along the Yellow River where some people still lived in cave homes. In the village of Yen Chuan, I met many aging paper cut artists who made intricate designs with paper, using only a common household scissors and their strong hands. This was a tradition handed down through from mother to daughter. Similar to the way quilting and other traditional women’s crafts are taught in a manner that not only encourages but also relies on sharing and copying, the tradition of paper cutting is an art commons. Each woman I visited would take out paper cuts, which were usually stored between the pages of their children’s textbooks, and lay them out so I could look at them. Occasionally the same pattern would appear at a different woman’s house. When I asked where the original pattern had come from, none of the women seemed to be able to answer or even comprehend the question. After repeated attempts to make myself understood it suddenly dawned on me that there was no particular attention paid to who first conceived a pattern in this part of China. Similar to the way quilting and other traditional women’s crafts are taught in a manner that not only encourages but also relies on sharing and copying, the tradition of paper cutting is an art commons. Young girls are taught to make paper cuts by first copying the patterns of others. Eventually, as this tradition is passed down through generations, the same patterns make their way into different homes, parts of one pattern are incorporated into new ones and different regions even become known for certain styles and motifs. Here was the commons, alive and kicking. But what meaning might it provide for those of us living in a culture—and artistic sensibility—saturated by market-based thinking? For many of us, it is hard for us to imagine how things might be different. In a basic, general way, it is possible to think of creativity as inherent in all humans—something we are born with and share as a gift or an inheritance. Kris Maltrud, a dancer in New Mexico describes it this way, “any kind of art—performance, literary, visual—art and its expression is essential and belongs to everyone. I consider creativity a birthright—something that all of us have that we share”. Lewis Hyde, a poet who has extensively explored the idea of the commons-based gift economy talks about an artist’s creative energy as the inner life of art—something generated, in part, by inspiration or intuition, organically bestowed upon humans as a gift, through no effort on our part. Another way of saying this is that artistic expression emerges, in part, from an essential aspect of being human—something we all have “in common”. This is one way we can understand art as a commons. This offers a look at another layer of how art is a commons. The commons is a place where we are linked with everyone else’s creative expression: a treasure trove of history and culture that has come before us and which influences how we perceive, envision and comprehend what is possible today. Something new emerges out of various combinations of cultural ingredients—traditions passed down from our families, rituals and ceremonies given to us by our communities and interactions with popular culture that we receive on a daily basis. Joy Garnett, a New York-based painter, reflects, “Art contains within it a multitude of cultural and historical references, symbolism, meanings, “baggage”, as well as the seeds of that which has yet to come. Art is a bridge between contemporary culture and all that has passed before; it allows for a pooling of information both past, present and future, and hence extends the commons across time. Catherine is also a founding member of The Institute for Infinitely Small Things, a research organization/artists collective in Boston that has a video you can see on their web site titled 57 things you can do for free in Harvard Square. This video shows individuals jumping up and down, playing games and enjoying the park—a humorous artistic work that reminds us that simple non-market ways to enjoy ourselves still exist, even in one of America’s famous gentrified shopping districts. Here, artists help us to see and name the commons and in so doing, help us take a step towards the reclaiming what belongs to all of us. Rachel Breen is an artist and member of the Fine Arts faculty at the Anoka-Ramsey Community College in Minnesota. Adpated from OTC’s All That We Share: A Field Guide to the Commons, published by The New Press.